Home > Chicago,_IL,_USA > Vendors > Chicago_Trolley_&_Double_Decker_Co. Chicago Trolley has the largest fleet of trolleys in the midwest. Our trolleys are built for us to our specifications with old world charm and grace. Our customers tell us that the personalities of our drivers make for a wonderfully fun experience. 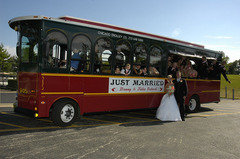 Think of us for wedding day transportation as well as bachelor(ette) party needs. Check out our Chicago theme photo tour ideas on our website.